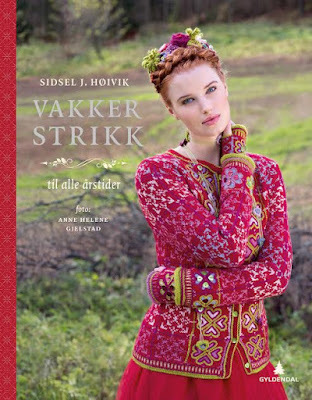 You can find Sidsel here and here on Ravelry. I find inspiration everywhere. In nature – then mostly colour combinations etc. 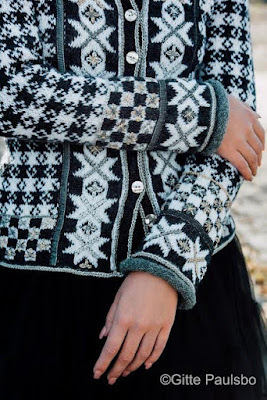 I find it in architecture, paintings, fashion, magazines, old traditional knitwear, very much in traditional costumes. 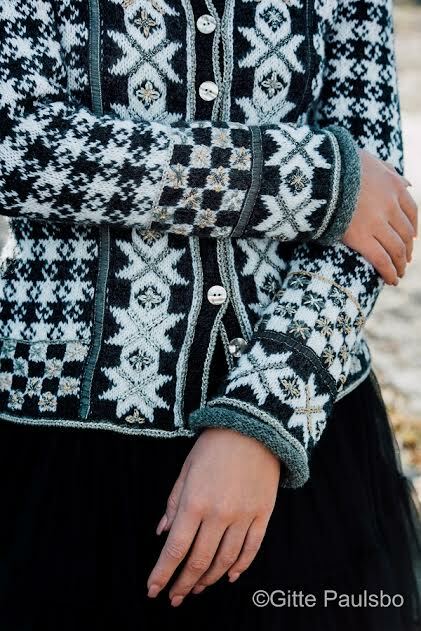 I find that a lot of fashion can be transformed into knitting. For a long time it has been stranded colour work knitting. But I love to combine different techniques in one garment. Which includes adding crochet, embroidery, sewing ribbons, sequins, beads etc. on to my knitting. I do look at other designers work and I get inspiration. I am not afraid of getting influenced by others as long as I can transform it to be “me”. I try very hard to transform the inspiration I get into my style. The secret is to get inspiration, but not copy anybody. Then I like to give credit to the designer who gave me the inspiration. I don’t know. I did not use to do that before, but in order to reach more customers and not have to answer a lot of private telephones and e-mails (which I do not have time for) I try to write thoroughly and step by step in order to reach as many as possible. But I do not think my patterns are for “dummies”. They are quite complex, with many details so I feel I have to write everything word by word, step by step. Very many people think my designs are very complicated. They are complex, but not too complicated. I use a lot of different techniques and use many details, but then I try to explain thoroughly in order that most people can understand. And I think they do. At least I have heard many times that people tell me that they thought it was too difficult, but they managed. 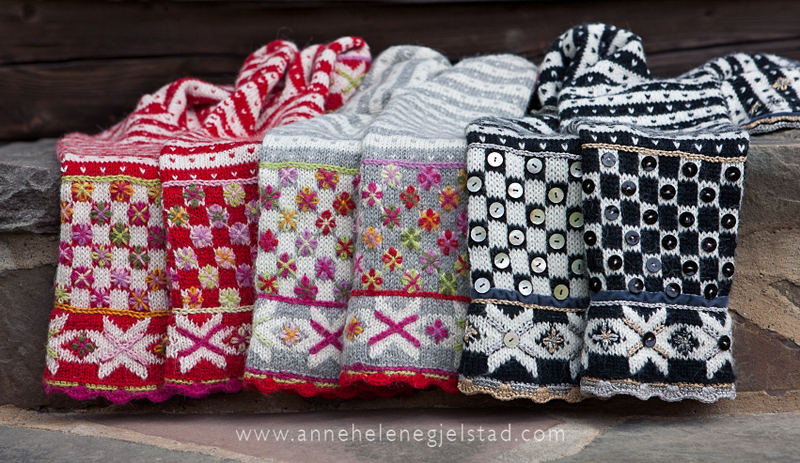 In that way I kind of feel that I help many people to take their knitting “a step further”. It depends. I try to spread the projects between the knitters so they have time to do something for themselves as well. All together I have 7 – 10 quite regular ones. I also knit some models by myself. I do not use test-knitters. 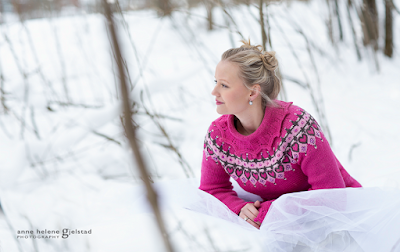 I use sample knitters who knit the models that I use for photo. The rest is mathematics. ;-) The sample knitters deliver an unfinished product. I always want to make all the decorations myself. I am never sure what it is going to look like in the end. That develops while I am working on it. I carry my knitting around with me in the house. I look at it in different lights, different angles and usually it takes a few days before I start. Sometimes I leave it on the table with a lot of things on top like ribbons, sequins, buttons, yarn etc. I often have to make the projects “mature/ripe?” in me. I often publish small teasers in social media, where I show them photos of different choices of buttons, decoration, ribbons etc. where I ask my followers what they prefer. When I started my business one year ago together with my business partner Tom, we did yes. Not really. I wish I had. I know a lot of people in the business and a few of them I am very close and familiar with. I can talk with them if I like, but I would love to have a real mentor. No, I do not. But when I understood that one of my models was going to sell very, very much I had one of my ex-colleagues who is an expert, go through the pattern for me one more time. She made a few changes and we made some improvements, but luckily everything was quite right. I am not very good at that. I work a lot and since this is also my hobby it’s hard to stop. But I never knit during the day. I make patterns, new designs, draw charts, answer mails, and work mostly on the computer during the day. After a certain hour in the evening I do knitting, embroidery, crochet and things where I can be social and comfy and do not have to use my computer. It depends where you live I think. 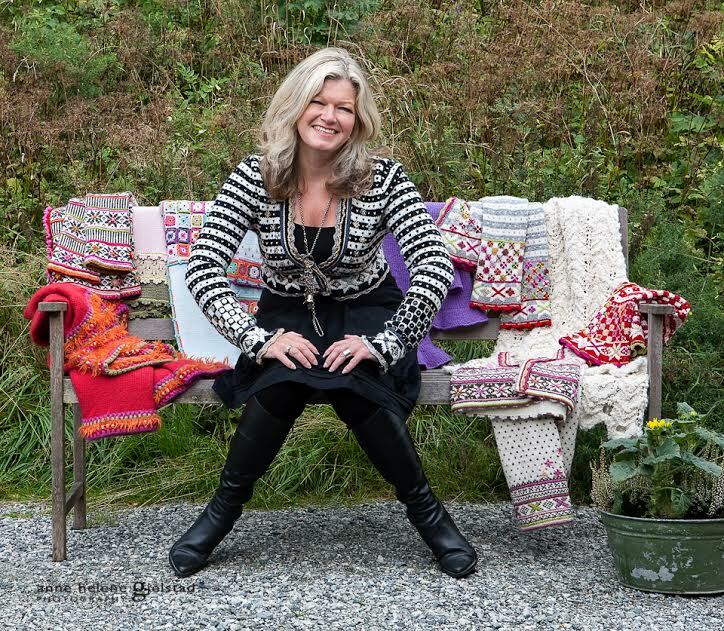 In Norway it’s not easy to make a living of knitting and most people have it as a second job. I did too for many, many years and made designs as a freelancer while my monthly income came from my main job. I used to design models for different yarn producer/suppliers, magazines and sometime I had very much to do and sometimes nothing. So I could not rely on that. Nowadays it’s different. 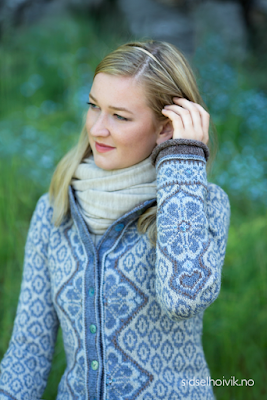 Now you can sell your patterns online to knitters all around the world. So the market is much bigger. There are more choices and you have more possibilities to reach a lot more people. I have never sold my patterns online. I sell yarn kits with all you need included in the kit – yarn, pattern, buttons, beads, sequins, ribbons etc. Next for me is continuing to make a lot of new designs to increase the models in my webshop. I had a little break in the spring and summer because my mother fell very sick and died in August. In that period the sale of my bestseller Morgendis / Morning Mist exploded and I did not have time to do nothing more than packing yarnkits and be with my mother. Now my aim is to make a lot of new bestsellers. ;-) I have many new models going. It’s been 11 months since I started my webshop. The plan was to sell to Norway, and maybe Scandinavia eventually. But very, very soon a group of Dutch knitters were very interested in my kits and we had to find a way to export. So I have my most popular patterns translated to English and we have started to translate them to Dutch as well. Since the interest is so big. I have for a long time received a lot of e-mails and requests from the US and Canada. For my books and for my patterns. So very recently I have started to send my kits all the way to the US and to Canada. It seems to work smoothly and I am very excited to see how this develops. I also have to translate more of my website in English. So I have a lot of projects ahead. All the photos from the books and many of the photos in the web-shop were taken by the gifted photographer Anne Helene Gjelstad. Thanks for sharing this interview Sidsel, and hello from Holland. Joke. 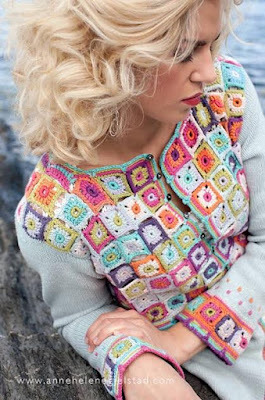 I want to get hold of your pattern for the bolero - fritt-etter-fana - is there a way you can supply ? Gill I think it would be best if you contacted Sidsel through Ravelry or her website. BTW we can't respond to you directly, blogger hides your identity from the blog.